In one word – completely. For those influenced by our recovery-centered culture for decades – which includes just about everyone in America today – The Freedom Model opens your eyes to the truth that the conventional view of addiction is patently false and addiction is really just another word for habits based on learned preferences. Addiction is a cultural construct based on a host of myths, junk-science, misinformation, fear, lies, and shaming. All of this is harmful to any individual’s belief that they have the ability to change their habits for the better. The Freedom Model rejects these myths, damaging rhetoric, and tactics meant to coerce and create forced abstinence in the user. The Freedom Model helps each person bring their innate power of choice back front and center by challenging all of the pillars of addiction myths our society has constructed. The Freedom Model provesthe fact that moderation is an equally viable choices along with the two poles of use: Heavy use and Abstinence. All options become viable when you consider that you can change your preferences based on what makes you happier and more fulfilled. The Freedom Model shows you that your heavy substance use can be temporary, is driven by personal preferences that can naturally change over time, and that you can proactively change by shifting your perspective on your options. Addiction is a life sentence of endlessly struggling to recover. The Freedom Model is the first and only effective permanent solution to end addiction completely and easily. The Freedom Model also addresses the shortcomings of remaining “in recovery”. Once you deconstruct a myth as large as addiction, all the ancillary myths, including the myth of needing lifelong recovery, fall prey to the truth of the compelling research found within The Freedom Model. 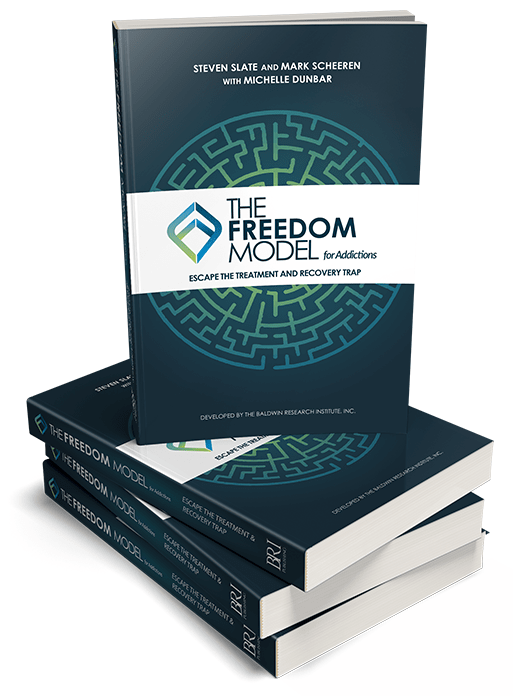 The Freedom Model debunks dozens more myths for the reader’s benefit. These examples represent just a sampling to give you a feel for just how different our approach is – as well as how powerful it can be. Every aspect of the addiction/recovery paradigm is scrutinized for its value and truthfulness in The Freedom Model. From this analysis, a very clear picture of personal freedom emerges and the groundwork for making changes in one’s life is provided and easily attained. Unlike the recovery-centered society, The Freedom Model clears away the difficulty in seeing just how efficiently you can change your habits and do so without any feelings of being deprived of what you desire. You can become truly free. *This statement does not include detox – some heavy, daily substance users may require medical detox treatment for their safety when ending substance use.